I'm giving this a try, it's the "fad" thing now - yeah, I'm late to the game, I know. Oh well, let's see how that goes - probably just as good as my MySpace & FaceBook stints... I give it 1.5 months, and it'll be done! Anyway, if your in any way interested, start following me. Update: I've updated the source to be compatible with the Preview 3 bits. Download and execution is the same, but the sample code within the post is no longer valid. Yup, nothing fancy and pretty straightforward. However, what if I needed to refactor my codebase and change my action method names... the task becomes straight forward when using ActionLink<T> in my views, but all of my controllers continue to compile even when they shouldn't be! Yes, if you're doing true TDD, this task is easy to spot because after refactoring, you can run all of your test cases and see which ones failed. Ohh, pretty - and hey look, refactoring now works! It even supports parameters, route value dictionaries, anonymous types. Even better, you can specify a completely different controller to route to! As you can see, it's fairly straight forward. This is something that I think is very useful, and gets more in line with how code should be written. Since this example is a bit lengthy, I've provided the source in downloadable format, so click here to get it. Hope you enjoy and use this in your applications! Move the Validate method from BaseValidator into a Controller extension method. Define a set of attributes that you can apply to your model's properties that will work with this validation model. A few things to note, is that you can still explicitly use individual validators, but note that they're no longer off of Html.Form() but Html.Validation() now. Lastly, while these changes have been committed to the MvcContrib trunk, they're still not available in any publicly released builds. You'll have to download the source and compile the binaries yourself until MvcContrib does another official build. Let me know what you think, and yes - I know, some people still don't like this approach :) It's not meant for everyone, and there's other projects out there that you can use. Enjoy, and let me know what you think of the progress. One nice feature that ASP.NET added in the 2.0 feature set was the ability to embed resources directly within an assembly and then later extract them through a separate Http Handler. You've notably saw this by all the WebResource.axd calls. If you're building a ASP.NET MVC view, you have two ways of extracting web resource urls. This way works great, as I said if you're using the WebFormsViewEngine and you're within the view itself. However sometimes you have a controller action or other html helper extension methods that are rendering HTML directly ... or you're just using a completely different view engine. At this point, you don't have access to ClientScript. The second way is by having your own extension method that will generate the web resource url for you. This way, you can get a web resource url anywhere you have an instance of your HtmlHelper object. What I don't like about this approach is that it is using reflection to invoke the private method, but considering these methods are not exposed anywhere (ohh, and you cannot create an instance of ClientScriptManager) this is the only approach that can be taken. Furthermore, remember this is an ASP.NET feature, and works very nicely within the MVC framework. The url, WebResource.axd, is mapped to the AssemblyResourceLoader Http Handler which is independent of the ASP.NET web forms runtime. Hope this helps some people! When developing ASP.NET MVC applications, most examples or sites have shown you starting from complete scratch. This is all and well if you have the time to completely re-write an existing application for 6+ months or have started a v1 product. Right, in the "real-world" the former rarely happens and if your a developer wanting to stay on the bleeding edge, introducing a new architecture into an existing ASP.NET application is fairly tedious. From converting existing pages, supporting legacy routes, and possibly the lack of allowing multiple forms all prove to be a challenge. As you know, I'm currently working on the CodePlex team and my biggest task I'm working on is slowly converting the site to use ASP.NET MVC. If you've been to this site, you know how extensive the site is, and how this challenge is very daunting. The one saving grace is that we can do it gradually since we release so often. But, because of this we have to take small steps converting pages (views!) that we can - while maintaining our original master page and other postback functionality. For this post, I'll use CodePlex as a reference point. We have 2 major sections that we're to worry about while working with ASP.NET MVC. Most importantly, we still have a single form on the page! This is a critical piece of information, because this limitation required us to make decisions we did to get around ASP.NET MVC within a Web Forms world. When working on a MVC view, we render everything within a main content section, and do not use ASP.NET server controls at all. The site also contains a project search on each page but this, however, still relies upon that singe form and the normal Postback model. Like any web application, you have content pages and you have forms based pages. CodePlex is no different. When converting each of these types, obviously, the former of the two is the easiest to convert. Why? Well, you don't have to worry about that single form tag and there's no need of posting data back to the server. So, when working with true content pages - converting them is as simple as creating your controller, action, and view. Now, just because you're still in a Web Forms model, still does not give you the right to continue to use ASP.NET server controls! Do you see the problem? No? Okay, well its the fact that upon a HTTP Post, your Action method is invoked prior to any event occurring within the ASP.NET lifecycle. That means, at an Action method level - you have absolutely no idea if your MVC form was submitted or was it that pesky Project search. Well, this isn't entirely true because how to get around this is by having a hidden input field in which you set a value when your MVC based form is submitted. I'll show a little later how this is used, but you can probably figure out how. Now, when your clients request /site/login, the login action will execute, and upon a POST to /site/login, the processLogin action will execute. Another scenario you should consider at this time, is that if you are converting a previous page, say "/Users/Login.aspx" you would want all subsequent requests to be routed to /site/login. To handle this, you can utilize my Legacy Routing methodology that would send a 301 http status code pointing the client to the new url. As example, I've followed the PRG pattern that I've previously mentioned, but there's one thing here that breaks that pattern. It's the RenderView("Login") if my hidden field does not match. Why do we need to break the pattern here? Well remember the lifecycle I previously mentioned. The only way for events to be fired from your master page, is that it too needs to "postback", thus falling back into the postback model. Once you can safely ditch the singe form, that code can be safely removed. As you can tell, having a mixture of ASP.NET WebForms and MVC forms is not a trivial task. There's a lot to consider when tackling this, and if at all possible SPIKE! Yes, spike your master pages so that you can have a Web Forms master page AND a MVC master page. By doing this, you do not have to follow the single form pattern thus negating almost all this post. 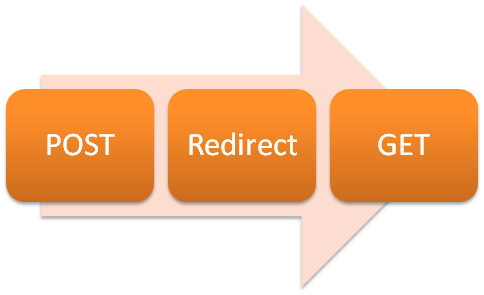 I would still recommend using the legacy routing to redirect your users to the new page as well as the PRG pattern, but you should always be doing that anyway :) Well, hopefully this post has served its purpose and given you some ideas on how to approach converting existing ASP.NET applications to ASP.NET MVC. If you have any other suggestions or better recommendations, please add a comment! Note: This post has been updated to work with MVC 2 RTM. The example code is a bit smelly (use POCOs, please!) but the workflow is what you should be mostly concerned about. The ASP.NET MVC pattern tends to lead itself into a more simplified and "true" HTTP experience by re-introducing patterns that have been lost, or at least, not followed in many years. One such pattern is the Post, Redirect, Get (PRG) pattern in which it is "to help avoid duplicate form submissions and allow web applications to behave more intuitively with browser bookmarks and the reload button" (Wikipedia). The major problems with this Postback pattern, is that hitting the Refresh button of your browser in steps 3 or 5 will re-post your submitted data. Step 5 is more of a problem as it could possibly re-submit that created information. Granted, there are steps that you can take to approach this problem, but this is how default ASP.NET Web Forms are treated. As you'll notice, where we previously could have had issues in step 3 or 5 before, we no longer have issues. If a user presses the Refresh button in either of those steps, they'll not get the lovely "Would you like to resubmit the form data" confirmation as featured below - instead, the page just reloads. When you implement your Create action, you have to keep in mind that validation may fail and you may need to re-display the form. TempData is best suited for this scenario, and is implemented as such. Next you'll implement your Submit action. This will perform some validation of the user input data, and if successful will save the info and redirect to the Confirm action. If it is not successful, we'll store the form data into the TempData and redirect to the action Create. This way we mimic maintaining the view's state even if it fails. Something very interesting to note in the above example, is that even though I've pulled all values out of the form into local variables, should either Price or Quantity fail in parsing and I set the TempData to the local variables...I would have lost the user input. So, it's always a smart idea to retrieve the data from the form directly into the TempData. Finally, the Confirm action needs to be implemented. 7:      Thanks for creating your product. 8:      <a href="<%= Url.Action("Create") %>">Click here</a> to create a new one. And that's it. As you can see from the Create view, when writing our textboxes, we give them a default value from the ViewData. You can download the sample application with this pattern running here. Please let me know of any suggestions or issues.